The other function that lead acid chargers have is a “return to bulk” voltage. A 100% full lead acid batteries voltage is approx 12.7v. Once the charger is in Float, it will maintain the battery at a pre-set voltage (normally between 13.3-13.8v subject to the battery type) and also support any loads running at the time. If the loads increase past the chargers maximum output in float, then the battery voltage will start to reduce. Once the voltage reaches the “return to bulk” voltage, the charger will then start a new charge cycle and start re-charging the battery. The “return to bulk” voltage setting in lead acid chargers is normally 12.5-12.7v. This voltage for a lithium battery is way too low. At this voltage the lithium battery will have been depleted to approx 10-15% state of charge. 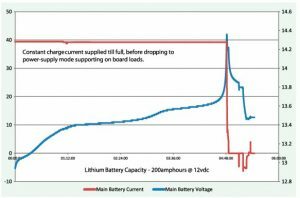 Lithium charge algorithms will normally set a return to bulk voltage of 13.1-13.2V. Just another reason that a standard lead acid charger doesn’t suit lithium batteries. Some lead acid chargers “ping” the battery on startup to determine the voltage/resistance of the battery. Based on return information, the charger then determines what charge phase to start in. Because lithium will hold voltage above 13+v, some lead acid chargers will see this as a near full battery and enter into a float stage and bypass the charge stage all together. If you want to use a lead acid charger on a lithium battery you can, HOWEVER, you must NOT use a lead-acid charger if it has an automatic “equalisation mode”, which cannot be permanently turned off. A lead-acid charger that can be set to charge no higher than 14.6v can be used for regular charging and then MUST be disconnected after the battery is fully charged. DO NOT leave the lead-acid charger connected to maintain or store the battery, because most will NOT maintain the proper voltage charge algorithm for lithium batteries and damage will occur to the battery and this is not covered under battery warranty.